Today board your flight bound for the Bay Area to begin your California Rail Discovery. Upon arrival meet your Tour Director and transfer to your hotel to begin a two night stay in one of the world's most beautiful cities, San Francisco. "The City by the Bay" highlights fascinating museums, world-class cuisine & amazing shopping. Tonight enjoy a Welcome Dinner with your fellow travelers. Today enjoy a San Francisco City Tour to see the Civic Center area, Chinatown, Golden Gate Park, Union Square, Seal Rocks, Pacific Heights & Pier 39. Experience a San Francisco Bay Cruise featuring views of the Golden Gate Bridge, Alcatraz & the city's skyline. Enjoy the rest of the day at leisure to browse the storefronts along Fisherman's Wharf, sample a chowder filled sourdough bread bowl or take a Cable Car ride. Maybe join an optional excursion to Muir Woods to see some of the oldest & tallest Redwood trees in the world. 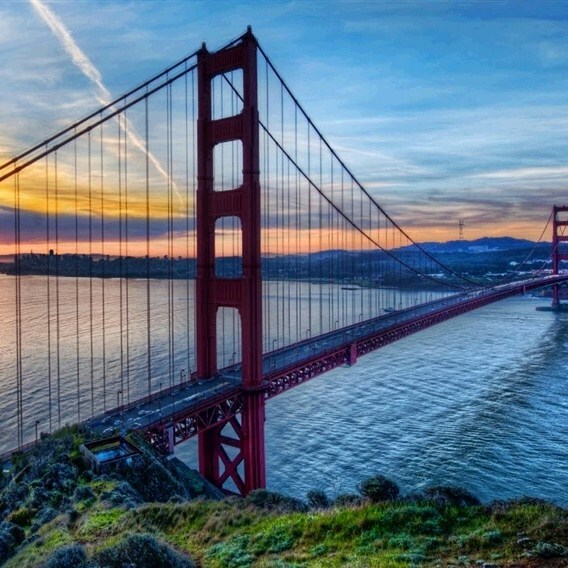 This morning cross the Golden Gate Bridge to visit the picturesque city of Sausalito, where you can browse the numerous art galleries and shops. From Sausalito the views looking back at the San Francisco Bay Area are spectacular. This afternoon enter california's most popular wine region for a Winery Tour & Tasting to sample the famous local product and learn about wine making. Later travel to Sacramento, California's capital and River city to check into your hotel for a two-night stay. 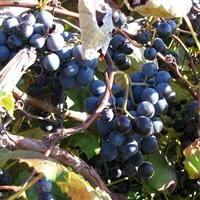 After breakfast travel to California's famous Napa Valley where hundreds of wineries prosper. 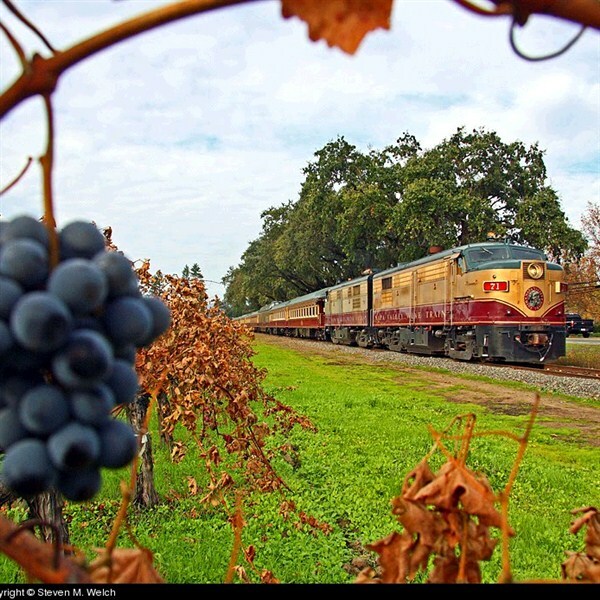 Board the Napa Valley Wine Train to injoy a Wine Tasting and lunch as you roll along the tracks through the incredibly scenic wine country. This memorable dining experience in faithfully resotred Pullman rail cars evokes the spirit of early 1900's luxury rail travel. Later travel back and visit Old town Sacramento, the commercial hub of the Gold Rush era is filled with shops, restaurants and entertainment venues yet retains 1800's charm with original storefronts and wooden sidewalks. Today board an Amtrak Train for a Sierra Nevada Rail Journey through the beautiful snow capped Sierra Nevada Mountains to the Lake Tahoe area. Disembark your train in Truckee and board your motorcoach to drive to the spectacular year round resort area of Lake Tahoe to spend the next two evenings in the popular and revitalized South Lake Tahoe/Stateline area. This morning travel through historic Carson City, capital of the Silver State of Nevada enroute to visit Virginia City, site of the Comstock Lode and once the richest place in the world. The famous Old West town was once the west's mining metropolis and featured notable residents Mark Twain & Bret Harte. Later enjoy a Lake Tahoe Paddlewheeler Cruise for spectacular views of picturesque Emerald Bay & the surrounding Sierra Nevada Mountains. Tonight's Farewell Dinner will be at a popular local restaurant. Today transfer to the Sacramento airport & return home with wonderful memories of your California Rail Discovery. Includes: Roundtrip airfare from Pittsburgh International Airport, motorcoach transportation, lodging, six breakfasts, one lunch, two dinners, admissions and sightseeing per itinerary, professional tour director, hotel transfers, baggage handling and taxes. Note: A valid government issued I.D. and birthdate is required. Walking Code 4: To truly experience the program and destination, you need to be able to participate in physical activities such as longer walking tours, walking over uneven terrain, climbing stairs and periods of standing. Some of the touring days may be longer, with select included activities occurring later in the evening.